Through 42 games, the Sabres have used a whopping 11 defensemen. Only two – Jake McCabe and Marco Scandella – have remained healthy all season. So for months, instead of summoning Guhle, 20, the Sabres utilized journeymen depth defensemen. Matt Tennyson, for example, played big minutes in October. For a few games in mid-November, Justin Falk skated on the No. 1 pair. 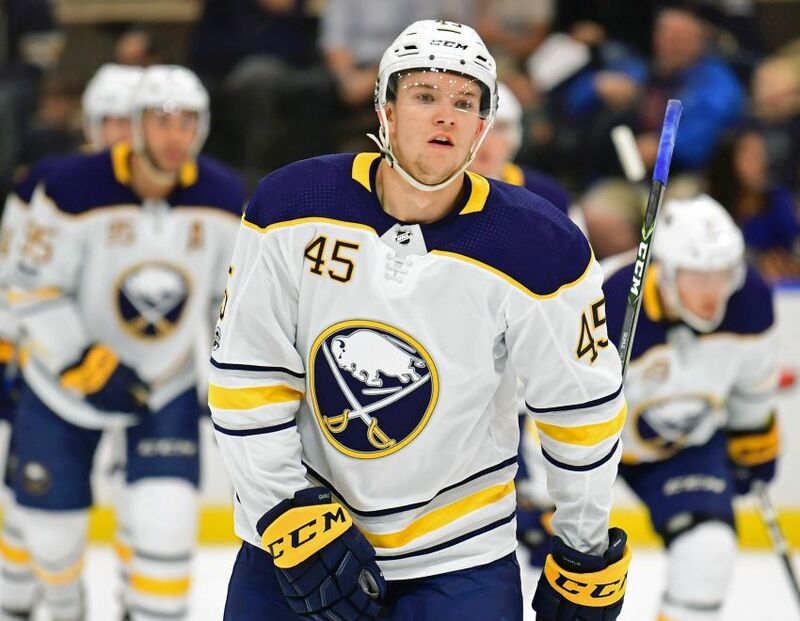 The Sabres also recalled three defenders – Taylor Fedun, Casey Nelson and Zach Redmond – ahead of Guhle. “They were winning hockey games (in Rochester), so it was a great chance for him to get some games, develop, bring his game to another level,” Housley said. But the reeling Sabres, who have a four-game losing streak (0-3-1) and an NHL-low 10 wins, desperately need a spark. The slick Guhle, a 2015 second-round pick, has acclimated to pro hockey quickly, compiling seven goals and 20 points in 35 AHL games as a rookie with the upstart Americans. He also has pumped a team-high 91 shots on goal. “They said I earned the recall,” Guhle said after the Sabres prepared for Tueday’s home tilt against the Winnipeg Jets, their first game at KeyBank Center since Dec. 22. Guhle’s puck-moving skills and offensive abilities should help the Sabres, whose defense has scored six goals all season. He scored a nifty overtime winner Friday, grabbing a loose puck inside the opposing blue line before roaring in. The Sabres also host Columbus on Thursday before beginning a four-day bye week. Guhle, who practiced beside McCabe, will almost certainly play Tuesday. Still, Housley wouldn’t fully commit to dressing the youngster. While Guhle’s promotion is special, he mentioned twice he was thinking about his Rochester teammates. The 22-8-3-3 Amerks have quickly grown close in three months. For the first time since the early 2000s, Rochester might be a legitimate Calder Cup contender. Besides talent, Guhle believes the Amerks’ leadership group – they brought back former captain Kevin Porter and ex-Sabres defenseman Nathan Paetsch – makes the team special. One of Guhle’s buddies, goalie Linus Ullmark, accompanied him to Buffalo. The Sabres also recalled the AHL All-Star because starter Robin Lehner had a maintenance day and is day-to-day, Housley said. Housley said defenseman Victor Antipin, out the last two weeks battling the flu, could skate later this week.